Holidaying at Florida Keys offers a unique pleasure - that of enjoying closeness of the sea on both sides of Florida Keys and enjoyable tropical climate. For ardent lovers of English literature, it would be interesting to know that Ernest Hemingway, the literary idol of 1930s and 1940s lived here for close to 10 years. It was here that the books 'For Whom the Bell Tolls' and 'A Farewell to Arms' were written. Be it family vacationers or honeymooners, one hundred miles of ocean paradise are sure to provide you with memories that will last a lifetime. Also known as 'Conch Republic', Florida Keys in an archipelago of about 1700 islands. Below the southern tip of Florida region or just south of Miami, thousands of small islands and coral reefs stretch over two hundred miles south and west. The islands are called Keys and the whole area is divided into five main regions, namely Key Largo, Islamorada, Marathon, Big Pine Key and Key West. Each region reflects its own character and attractions that is truly region-specific. This is America's tiny island independent nation that was founded in 1982. The islands are well connected by bridges and causeways. Cruise ship and ferry services are available almost every day to Key West. An international airport on the tiny island, and a road called US-1 are the other two transport options that can get you to Key West, one of the easiest destination on Florida Keys. Air: Keys Airport shuttle - Marathon Key and Key West are the two main airports. Check for door-to-door shuttle service to and from Key West and the Florida Keys, Miami and Ft. Lauderdale airports. 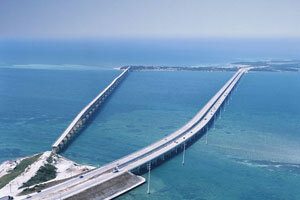 Road: You can find your way to Florida Keys from North, West directions or from Miami International Airport. Familiarize with 'mile markers' which is the region's method to find directions to establishments and attractions. Greyhound Keys Shuttle: Check for availability of three daily scheduled bus departures from Miami and the Miami Airport to all areas in the Keys. Marathon, Big Pine Key and Key West have bus terminals. From lavish hotels and resorts, luxury homes to feel-like-home comfort inns and motels, Florida Keys caters to wide cross-section of visitors. It is not a tedious affair to locate affordable accommodation that provides host of comforts. All the five regions of Florida Keys have hotel rooms that provide value for money. Tourists throng Florida Keys during October. During this period, the hotel rates are much higher compared to off-season rates. In the month of September, hotel rates are considerably cheap and quite affordable. Florida Keys offers world-class sport fishing, scuba diving and snorkeling, boating, sailing and kayaking. As you visit each area, you will discover region-specific attractions. Key Largo: Offers finest diving and snorkeling area amongst the five regions. Apart from 2 miles of mangrove wilderness that befits an exploration trip, the area is famous for John Pennekamp State Park. You can have a close brush with underwater life; a glass-bottomed boat that can make it possible. Islamorada: This Island on the South of Key Largo is referred to as the sport fishing capital of the world. So much so that prominent personalities like Presidents Hoover, Truman, Carter and Bush, sports celebrities, writers and media personalities have enjoyed fishing here. With the help of fishing guides, you can venture into the sea. Deep-sea charter fishing to catch different species like game fish, sailfish and marlin or swimming with the dolphins, Islamorada is a tourist delight. Marathon Key: Fondly referred as 'The Heart of the Keys' by the locals who have made this place their home, Marathon Key continues to be a popular fishing village since the 19th century. While fishing is allowed in some areas, specific areas have been earmarked for fish viewing by divers and snorkelers. Moving to the north end of the town, you will find Crane Point Hammock, which is a 64-acre protected area of historic sites. You can find a dolphin research center and turtle hospital here. Big Pine Key: This place derived its name from pine trees, which probably once grew abundantly, though not any more. It is pre-dominantly boating that interests tourists, apart from tours and trips to Looe Key Coral reef for diving and snorkeling. Besides vast expanse of sandy beaches, Big Pine Key's other attractions include parks, shopping hubs and the National Key Deer Refuge. Key West: Being the last resort at the Southernmost Point in the continental U.S, Key West aptly brings down the curtain to a Florida Keys visit with fabulous sunset viewing. Apart from history-enriched attractions such as the restored lighthouse, other attractions include diving and snorkeling in coral reefs, saltwater fishing and deep-sea fishing, viewing dolphins or kayaking in the back country off Key West. Towards the end of the day, unwind joyfully tapping your feet to great music. First Published Date: Nov 17 2006 Last modified Date: April 25 2019 This page may have been updated recently as new information is available or the content may have been edited for better readability.